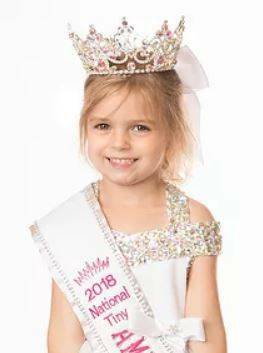 Three-year-old Larkin Dean of Fayetteville is the new 2018 National Tiny Princess in the American Royal Beauties pageant system. Dean also competed in the Cinderella pageant system this past year and won the Tiny Tot Overall title in the Dayton area prelim, the Miss Tiny Tot Personality title at the state competition and competed for the first time at the Cinderella International Pageant in Dallas, Texas at the end of July. Her parents are Hank and Jodelle Dean of Fayetteville; her grandparents are Hank and Esther Dean of New Vienna, David and Mona Crone of Mowrystown, and Lanny Stricklett of Manchester; and her great-grandparents are Carl and Doris Jean Crone of Lynchburg and Marlene Yarger of Mowrystown. https://www.timesgazette.com/wp-content/uploads/sites/33/2018/08/web1_Princess-Larkin-pic.jpg.jpgThree-year-old Larkin Dean of Fayetteville is the new 2018 National Tiny Princess in the American Royal Beauties pageant system. Dean also competed in the Cinderella pageant system this past year and won the Tiny Tot Overall title in the Dayton area prelim, the Miss Tiny Tot Personality title at the state competition and competed for the first time at the Cinderella International Pageant in Dallas, Texas at the end of July. Her parents are Hank and Jodelle Dean of Fayetteville; her grandparents are Hank and Esther Dean of New Vienna, David and Mona Crone of Mowrystown, and Lanny Stricklett of Manchester; and her great-grandparents are Carl and Doris Jean Crone of Lynchburg and Marlene Yarger of Mowrystown.